This possibility is explored in a new article published in Physical Review Letters. Physicist Maurício Richartz, a professor at the Federal University of the ABC (UFABC) in Brazil, is one of the authors of the article, produced by Silke Weinfurtner's group at the University of Nottingham's School of Mathematical Sciences in the UK. The research was supported by FAPESP via the Thematic Project "Physics and geometry of spacetime," for which Alberto Vazquez Saa is the principal investigator. "While this study is entirely theoretical, we've also performed experimental simulations at Weinfurtner's lab," Richartz told Agência FAPESP. "The apparatus consists basically of a large water tank measuring 3 meters by 1.5 meter. The water flows out through a central drain and is pumped back in, so that the system reaches a point of equilibrium in which the quantity of inflow is equal to the quantity of outflow. We simulate a black hole in this way." He provided further details to explain how this was done. "The water flow speeds up as it approaches the drain. When we produce waves on the surface of the water, we obtain two important velocities: the velocity of wave propagation and the velocity of the overall water flow," he said. "Far from the drain, wave velocity is much higher than fluid velocity, so waves can propagate in any direction. The situation is different near the drain, however. Fluid velocity is much higher than wave velocity, so the waves are dragged down by the water flow even when they're propagating in the opposite direction. This is how a black hole can be simulated in the lab." "A careful analysis of the ringdown spectrum reveals the properties of the black hole, such as its angular momentum and mass. In more complex gravitational systems, the spectrum might depend on more parameters […]", the authors write in the article published in Physical Review Letters. 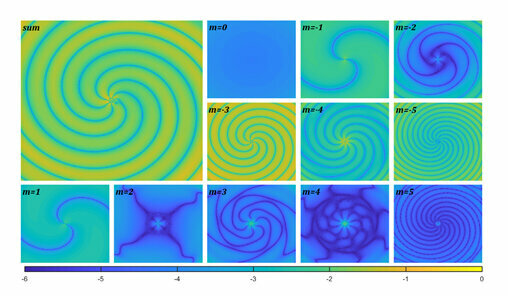 "In the simpler models, it's generally assumed that the vorticity of the fluid is equal to zero. This is a good approximation for regions of the fluid located at a distance from the vortex. For regions near the drain, however, it isn't such a good approximation because in this case vorticity becomes increasingly important. So one of the things we did in our study was incorporate vorticity," Richartz said. 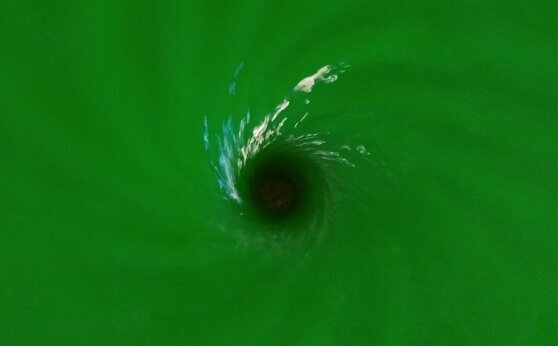 "In our study, we investigated how vorticity influenced quasi-normal modes in the hydrodynamic black hole analogue. Our main finding was that some oscillations decayed very slowly, or in other words remained active for a long time, and were located spatially in the vicinity of the drain. These oscillations were no longer quasi-normal modes, but a different pattern known as quasi-bound states," Richartz said. Black hole quasibound states from a draining bathtub vortex flow arxiv.org/pdf/1801.08473v2.pdf.